A few years ago a range of amazing supercars came out which set a new benchmark in the supercar world and more recently been added to with another few, these cars are the Ferrari 458, McLaren MP4-12C and the new kid, the Lamborghini Aventador. But now the convertible versions are being released and once again they up against each other to see which one is best (with no head). As you may know the Ferrari 458 Spider is already released and recently McLaren have released pictures of a face lifted and faster version of the ordinary McLaren coupe, despite only being first built in very late 2010. McLaren are also planning for this face lifted version to be roofless too. But the current coupes price being at around £168,500 and the Mclaren Spider to cost £195,500. That’s £27,000 more, which even being a supercar is quite a lot for just a convertible version. But even the face lifted version with only 15 Bhp or so is still about £17,000 more than the current MP4-12C. The face lifted version of the convertible will have 617 Bhp, like the new coupe. This seems quite confusing but Ferrari has taken the simple approach. Just build a convertible and don’t bother doing anything else. The top speed has been reduced to just 198 Mph from 204 Mph. And instead of doing 0-60 Mph in 3.2 Secs it in now does it in 3.4 Secs. Which is not bad considering it ways about 120 Kgs more than the coupe. 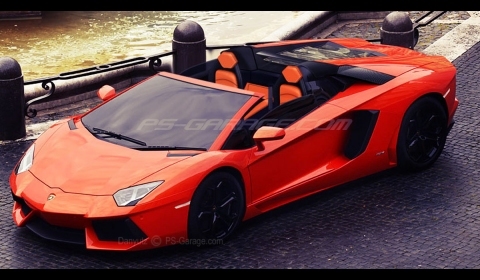 So now what about the Lamborghini Aventador, despite the others main rival still being the Lamborghini Gallardo LP550-2 Spyder, the Aventador still falls into this category. But this also being the newest meaning no figures and no official pictures being released yet, it hasn’t even been confirmed for production yet. But below is a picture of what the car could look like . . .
. . . and its rivals . . .
We won’t know for sure until the Mc Spider and Aventador Spider are available to drive and have been reviewed. But who would win a drag race? As the speed of these cars is probably quite important when buying. It is quite easy deciding even without any specs. The coupe versions will have roughly the same power as the convertibles, meaning with higher Power, Top Speed and 0-60 time the Aventador would be the winner of a drag race. But to drive nobody knows and that is also a key feature when buying a convertible supercar. Meaning a hard choice of which to buy still remains.